(Lat.,=made in layers), layered structure formed by the deposition of sedimentary rocks. Changes between strata are interpreted as the result of fluctuations in the intensity and persistence of the depositional agent, e.g. high land mass projecting conspicuously above its surroundings and usually of limited width at its summit. Although isolated mountains are not unusual, mountains commonly form ranges, comprising either a single complex ridge or a series of related ridges. ..... Click the link for more information. . Porous and permeable rocks of anticlines often contain oil and gas reservoirs. Organic remains of late Paleozoic tree fern swamps were converted to anthracite coal during the folding of the Appalachian Mts. (also flexure), a tectonic structure in which a stratum or bed is strongly bent in two opposite directions. A fold consists of five elements, namely, two bends and three limbs. Two of the limbs are outside the bends; the third, or middle, limb connects the bends. Each element is described by its own bedding parameters, and the relationships between the parameters determine the many varieties of folds. 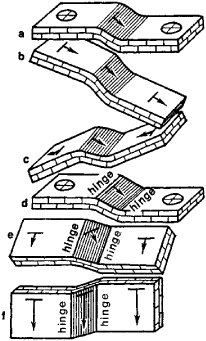 According to the bedding of the limbs, we distinguish among simple, plunging, and cross folds; according to the inclination of the hinges of the bends, folds are classified as vertical, inclined, and nonplunging (Figure 1). The size of a fold ranges from fractions of a meter to many kilometers. The inclination of the limbs ranges from barely discernible to vertical. Folds are found in cratons and folded regions. Especially large folds are found along the margins of cratons and the edges of syneclises. Some folds affect the accumulation of sediment and determine the distribution of the facies and thicknesses of sedimentary strata. Folds are sometimes associated with petroleum deposits. A plication or doubling, as of various parts of the body such as membranes and other flat surfaces. A bend in rock strata or other planar structure, usually produced by deformation; folds are recognized where layered rocks have been distorted into wavelike form. An invisible line on a Web page that is at the bottom of the first full page on screen. See above the fold. In conclusion, our observations suggest that EUS-FNA is a very accurate and less invasive procedure with favorable sensitivity and specificity in the diagnosis of endoscopic biopsy-negative diffuse gastrointestinal lesions appearing as exaggerated gastric folds or as flat or circumferential lesions. To further evaluate any esophageal involvement of the scleroderma, an esogastric radioscopy was performed, which visualized two lacunar images in the pyloric antrum and hypertrophic gastric folds (Figure 4). The GE junction is radiographically identified where the gastric folds terminate.